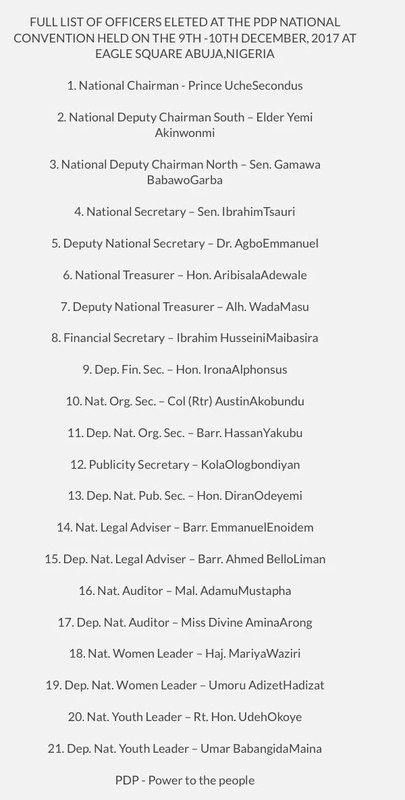 If you couln’t make it to the venue of the National convention or couldn’t watch the event live on television, here is the full list of elected PDP officers at the national convention 2017. You can check the list right here on campuspeep.com. So if that is what you have been searching for all these while, search no more as you have finally landed on the right page to get that information digested. The Peoples Democratic party (PDP) elected its national executives during the National Convention held at Eagles square Abuja. According to CAMPUSPEEP.COM Uche Secondus emerged victorious as the National chairman of the party while Ibrahim Tsauri emerged the National Secretary of the party. Kola Ologbondiyan and Hon. Diyan Odeyemi emerged the Publicity Secretary and Deputy Publicity Secretary respectively.